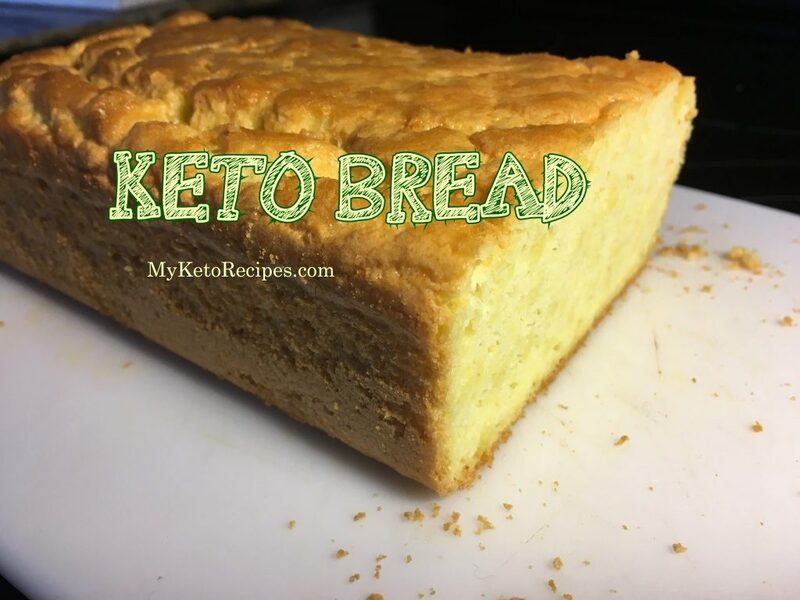 This is the best keto bread recipe for your ketogenic lifestyle! 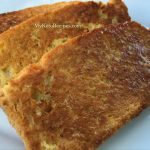 Easy to make and tastes amazing, especially toasted with some butter on it! When people start a low carb or ketogenic lifestyle I find one of the food s they miss the most is BREAD. Bread plays such a big role in the typical high carb diet and is one of the foods that increases glucose levels in our body and isn’t very healthy at all. If you are trying to lose weight, it can be very difficult if you eat bread. So what do you do when you have that craving for bread and you are doing low carb? You make KETO bread! Keto bread is actually better then you might think. I toasted mine, as you can see in the pic above. I love it toasted and I didn’t use a toaster to do this. I toasted it in a frying pan for a few minutes on each side with a little butter on it to help it brown. It turned out perfect! You can add peanut butter, butter or even an egg to the top after you toast it. You can also make yummy low carb sandwiches out of keto bread. It can also be used to make croutons for salads or breadcrumbs for recipes. The possibilities are endless. 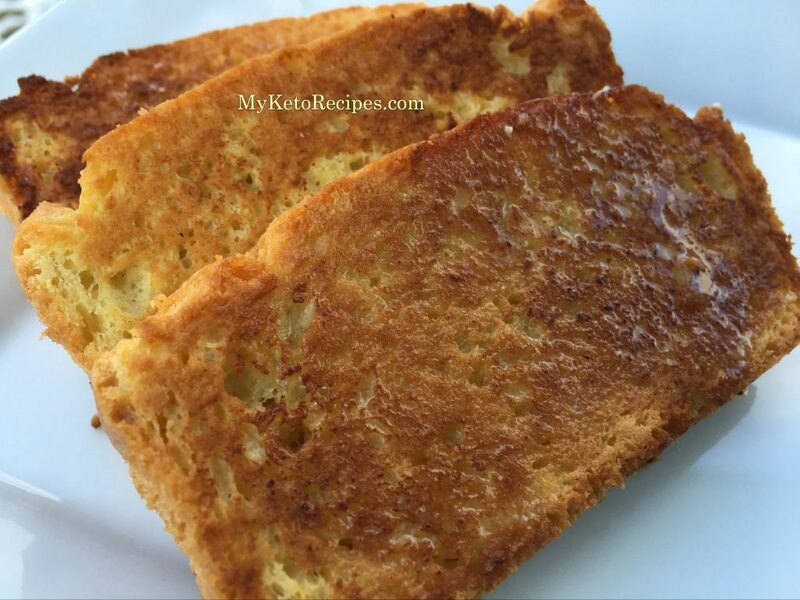 Keto bread is very easy to make and only calls for a few ingredients. You will need to find a store that sells almond flour. It is becoming more common to see various kinds of flour sold in stores now as many people discover they have issues with eating gluten. Almond flour is gluten free. Each slice of this bread has 1.35 grams of net carbs so it perfect for your keto approved food list. My kids tried the bread the other night with Keto Chili and they really liked it! They actually dipped it into their chili! YUMMY! Keto bread stores well in the fridge and can be frozen as well. Slice it as you go so it stays fresh! Enjoy! Recipe note: When mixing ingredients do not over mix. You want your Keto bread to be light and airy! Separate the egg whites from the yolks. In a hand or stand mixer to beat egg whites and Cream of Tartar until soft peaks form. Use a hand mixer to beat egg yolks, butter, almond flour, baking powder and salt. Mix well until combined. The dough will be thick. Add 1/3 of the beaten egg whites to the almond flour dough mixture and mix together. Add the rest of the egg whites to the dough mixture and combine. Do not over mix! Buttered a 8x4 loaf pan and add bread mixture. Bake for 30 minutes. Check to make sure bread is cooked with a toothpick. Looking forward to trying this. Hope it tastes as good as it looks. This is an awesome recipe! Thanks! I made this and added ground flax seed and cinnamon…..very good! can you use regular flou r? Doing low carb will help. You can talk to your doctor about doing a ketogenic diet. it has helps many diabetics lose weight and get healthier. Does it have to be almond flour I don’t recall seeing that flour. Yes it does to be low carb. It’s in the natural food section at any food store. I made this and it tasted good, more like cornbread texture though, but to be expected since its almond flour. Just curious… I’m about to make this bread and I noticed that youre serving size listed is one loaf does that mean the nutritional breakdown at the top is for the whole loaf or is that for one slice? Just made this and it was amazing. Followed the recipe exactly as is. Thank you for a great recipe. does this recipe work without egg? i’m allergic and wondering if you’ve experimented at all? So happy th find this recipe. I was looking for Gluten free and i was also researching Keto (I have to eat better with having MS) Thank you souch for sharing. Do you need xanthan gum? Thrilled to find Canadian site. Thank you for net carb info on this one. Can I use baking powder instead of cream of tartar? What’s a good substitute? If you don’t have a mixer can you use a hand whisk ? What’s the fiber in a piece? How many carbs per slice, these recipes always leave out that information. This is the best keto bread I have tried. I made with your chili recipe and it was a hit all around. I think I will add some cinnamon when I toast it next. Thanks for sharing!! Love this recipe! I want to make it in my air fryer oven, do u think the temp would b the same? Does this bread taste like egg? tried your bread the taste was great however my loaf would not release from the pan i buttered it should i have used parchment paper like most recipes?